LAGOS FEBRUARY 12TH (NEWSRANGRS)-Former Secretary to the Government of the Federation, Babachir Lawal and five others were arraigned in court. They pleaded not guilty to a 10 count charge of fraudulent diversion of funds meant for the clearing of evasive plants on the North East. 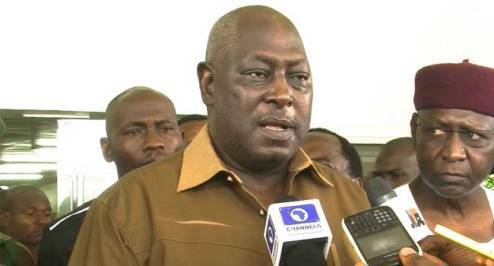 Lawyers to Babachir Lawal and the defendants argued their application for bail before Justice Okeke of the Federal High Court in Abuja. The court ordered them to be remanded in the custody of the Economic and Financial Crimes Commission till Wednesday. It also filed four charges of alleged fraud against a former Director-General of the National Intelligence Agency, Ayodele Oke, and his wife, Mrs Folashade Oke. Oke and his wife were to be arraigned before Justice Aneke of the Federal High Court in Lagos on Friday, February 1, 2019, while Babachir Lawal was arraigned before an Abuja High Court today.